The building, often referred to as the “Barnacle Building” will be demolished in late January, 2018. Demolition of the waterfront building located at 18408 Angeline Avenue in Downtown Suquamish will begin later this month. Work to raze the aging structure, formerly home to Scratch Kitchen and Bella Luna restaurants, is scheduled to start on January 22, 2018 and is expected to take a week to complete. Port Madison Enterprises (PME) owns the property, and made the tough decision to remove the building after an assessment last year. The side of the building faces a steep cliff on the waterfront in Downtown Suquamish. Though the building will be torn down, PME is taking steps to ensure the unique tree near the entrance remains on the property. “The building’s location on the cliff, its’ age and condition were all factors in the decision. We just aren’t able to salvage the structure,” said PME Board of Directors Member Windy Anderson. After demolition, PME plans to create a covered, open space area on the property to be used for multiple vendors, including those selling food items. “Hopefully we will be able to utilize the space to provide the community with multiple food choices by late summer,” added Anderson. 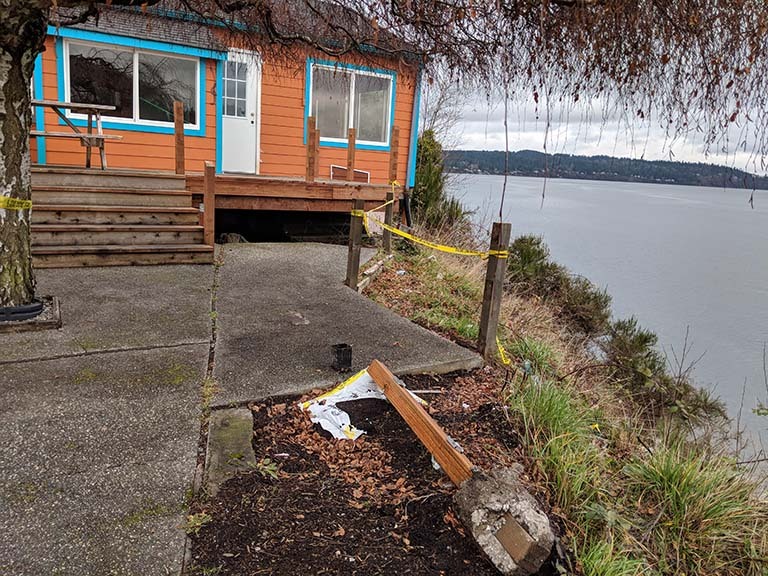 Though the building is slated for demolition, the Suquamish Tribe Archaeology and Historic Preservation Program has been tasked with ensuring the history of the property is recorded. During the last 50 years, it’s been a restaurant, a coffee cantina, a head shop, an art studio, an apartment complex and a private residence. Property records indicate the building was constructed in 1948 and originally used as a hotel for travelers. However, there is some debate about whether the building was built on the property, or ferried over by barge from Seattle, WA. An aerial photograph of the Suquamish Waterfront cir. 1930, detailing the location of the old Suquamish Ferry Dock and Ticket Booth, shows the undeveloped property where the building would later be located. 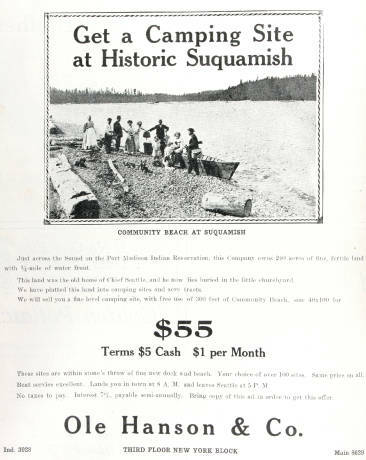 Courtesy of the Suquamish Museum archives. 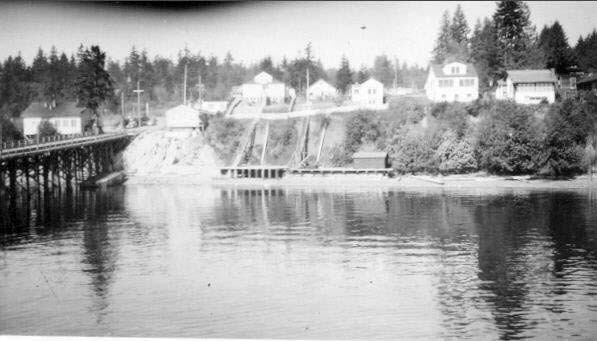 A photo of the Downtown Suquamish waterfront estimated to be taken in the 1950s’, where the building can be viewed next to the old Suquamish Ferry Dock. “Unfortunately, this is an era where we don’t have a lot of information in our archives for those properties. During the early decades of the 1900s the federal government aggressively implemented assimilation policies, including land allotment policies that allowed reservation property to be sold out of Tribal member ownership. BIA Agents used discriminatory regulations that declared Tribal Members non-competent giving them the access to sell lands, mostly large waterfront parcels like downtown Suquamish,” said Traditional Heritage Specialist Marilyn Jones. An old advertisement that appeared in the Seattle Star, offering cheap land on the Port Madison Indian Reservation. For more information on the Allotment & Assimilation Era click here. 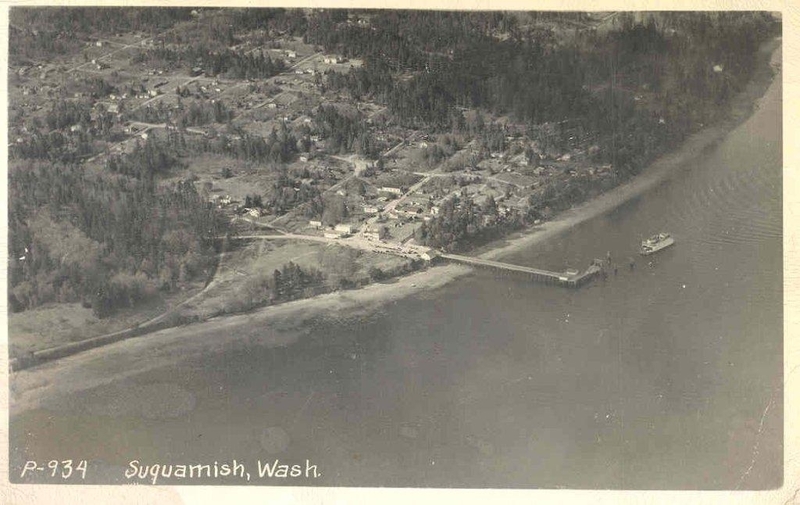 For more information on the early 20th century history of the town of Suquamish click here. PME’s purchase of the property, and several others in the downtown Suquamish area over the last decade, is part of the Suquamish Tribe’s “Buy Back the Reservation” initiative. 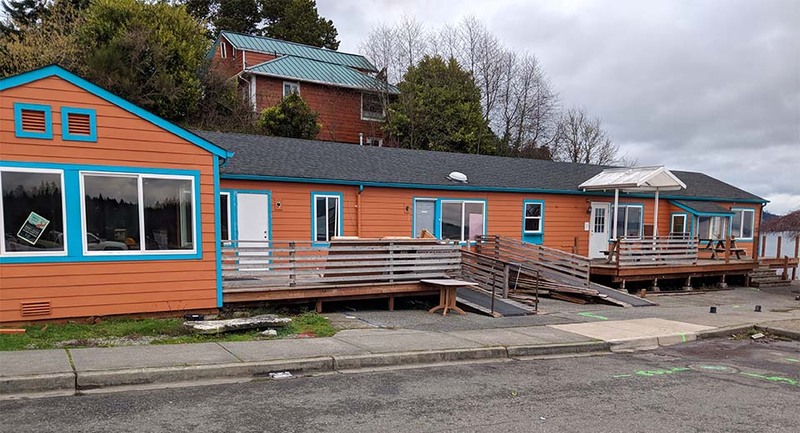 With help from a combination of funds, including profits from Tribally-owned businesses, the Suquamish Tribe has been able to purchase individual properties back from private owners. In 2015, the Reservation Buy Back Initiative reached a new milestone when the Tribe negotiated the purchase of a 220-acre parcel of land at the headwaters of Cowling Creek. The acquisition, coupled with properties owned by the Tribal Government and those owned by individual Tribal members, meant that the Suquamish owned more than half the properties within reservation boundaries for the first time in more than half a century. The Suquamish Tribal Government continues to make the initiative a priority and sets aside funds for purchases when available each year.